Michael was a cat person. (Myself, I don’t take sides. I grew up with both cats and dogs and both have their charms—and their allergens). Michael and his pet kitten. He was also a gardener. The garden on Miller Hill was his annual project, filled with deliberately chosen climate- and soil-appropriate flowers to keep the walk up to the front door beautiful. Getting to the house, it being tall and at the very top of the hill, required quite a hike. The driveway was very steep, leading to the basement of the house. The first floor of the house was a mother-in-law apartment (his sister Vanessa lived there for a long while). So to get to the main house, one climbed the garden stairs, then the exterior stairs up to the main balcony on the west side of the house, where the front door opened into the dining and living rooms, with their cathedral ceiling. One of the housecats on the wall of Michael’s garden. The seventh poem in Cape Cod Light, Death Watch, is compact and concrete, like an extended haiku, with straightforward symbolism. A bat is killed and buried in the garden; the cats play their natural role of hungry predators. The unavoidable backdrop to this poem is that around 1990 (the time we arrived to live in their apartment in Brookline) his partner of 5 years, David Harkins, was diagnosed with AIDS. Shortly thereafter, Michael and David relocated to the Cape house full time so they could make the most of their time together. 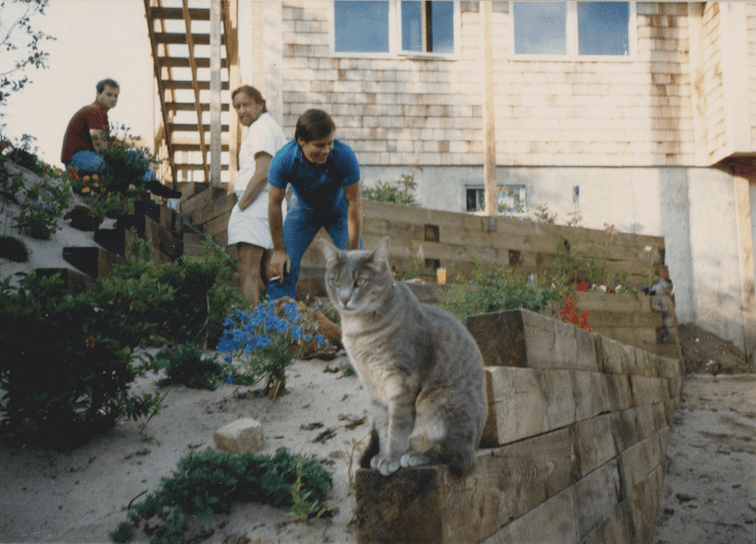 Both the incubation period and the time David lived with AIDS were on the long side at the time, and so for many more years we knew Uncle David and his family every holiday on the Cape. Cape Cod Light was published the year after David’s death. This poem foretells what is, for those of us who knew Michael and David, the emotional heart of the book to come. Death Watch first appeared in Poet and Critic. On the third step up from the kitchen. The cats murmured like water. The cats leapt to the aroma. They smelled it every day. They guard the mound like Sphinxes. The next poem is here. This entry was posted in Cape Cod Light on November 18, 2018 by jtw13. Do NASA and the NSF support SETI? Except where explicitly noted, the content of this site represents my personal and/or professional positions, which are are not necessarily those of my employer, Penn State University, or any other organization or entity.